Stems: High climbing or sprawling when there is no support. Leaves: Opposite, stalks 1.5 to 2.5 inches long, odd-pinnately compound, to 12 inches long, mostly glabrous; leaflets 5-13, lanceolate, 1.5 to 3 inches long, 1.25 to 1.5 inches wide; margins coarsely toothed; tips tapering to slender points. Flowers: Showy; calyces 5-lobed, leathery, brownish orange; corollas trumpet-shaped, 2 to 3.5 inches long, orange to reddish; lobes 5, spreading, lower lobe prominently notched; stamens 5, 2 long, 2 short, 1 vestigial. Fruits: Capsules, short-stalked, 4 to 8 inches long, tapering toward both ends, beaked; seeds numerous, flattened, 2-winged. Habitat: Open wooded areas, thickets, stream banks, fencerows, and roadsides. Distribution: Principally east third of Kansas. 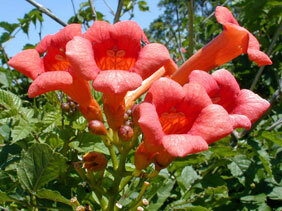 Comments: Trumpet vine is one of the few non-tropical members of the Bignonia Family. The stem grows faster on the side receiving sunlight, causing it to bend toward objects that it can climb. Pollination is facilitated by hummingbirds and long-tongued bees.